Welding hose made of synthetic rubber and yarn is designed to convey oxygen, acetylene and other compressed air. It consists of an inner layer, reinforcement layer and outer layer. The inner layer makes of NR and SBR synthetic rubber with reinforce agent added which has high air-tightness and bending resistance. The reinforcement layer uses the high tensile synthetic yarn braided or spiraled. It makes the hose high-pressure resistance. The outer layer is made of NR and NBR synthetic rubber which features anti-aging, anti-ozone. It is widely used for welding equipment. Inner layer: NR and SBR synthetic rubber, smooth black color. Reinforcement layer: high tensile synthetic yarn braided or spiraled. Outer layer: NR and NBR synthetic rubber, red and blue, etc. 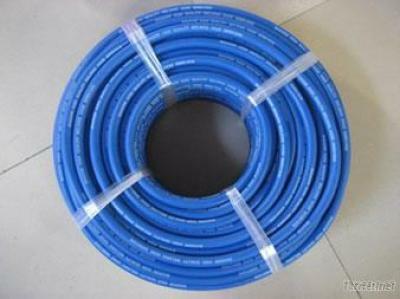 Welding hose is ideal hose to convey oxygen, acetylene and other inert gases for welding and cutting equipment. It is widely used for mining, shipbuilding, mechanical, building, steel, electricity and water conservancy industry.